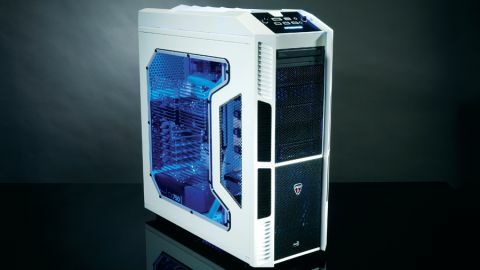 A £1000 gaming PC with water cooling. What's not to like? The very first thing to catch your eye on this AdvanceTec build is the striking XPredator chassis, all stormtrooper white with black grills getting all up in yours. It also has a huge Perspex side panel, which reveals the second thing to catch your eye - the water-cooling setup. This isn't the only build in the test to feature liquid as an aid to chilling out your chips - the Cyberpower Infinity Apollo has a closed-loop water cooler - but this is the only one to use a separate pump and reservoir setup. That means the setup can be expanded if you decide you want to include a loop for the graphics card, or even stick another reservoir in between to provide extra cooling for both. Sadly though, the extreme (and extremely pretty) water-cooling setup in this machine hasn't translated into a serious overclock on the CPU itself. In fact, the ATFX rig ships with the slowest clocks of all the i5 machines in the test, sitting on its laurels at a mere 4.3GHz. That means AdvanceTec garners the slowest CPU benchmarks of all nine test PCs here. That's a big disappointment considering how intense the setup looks. With a little light tweaking - a simple bumping of the multiplier in the BIOS - we were able to get a rock-solid 4.7GHz out of the 3570K. It's swings and traffic circles though, as it's the only machine here to opt for an AMD graphics card over an Nvidia one, and in the benchmarks that really makes a difference. The overclocked HD 7970 may not have the edge in the Heaven synthetic test, but in the four gaming benchmarks it pulls out a very obvious lead. The only fly in the ointment here is Advance Tec's questionable decision to ship the setup with the Lucid Virtu tech plumbing the CPU and GPU together in-game. In Just Cause 2 and Metro 2033 it made no difference in performance, but it gave a little boost to DiRT Showdown. The Shogun 2 test was a different matter, showing a massive performance boost, but that was tempered by the terrible graphical errors that accompanied it. Something we couldn't live with, and would lead to us immediately turning off the Lucid Hyperformance mode. That perhaps explains why no-one else wanted to get with the Lucid lovin', but on the flip side AdvanceTec was also the only SI to actually enable the Intel Smart Response tech with the small SSD. Pairing the SSD and HDD together meant it felt almost as responsive as a full SSD system, and had the same boot time too. So it's a bit of a mixed bag for the ATFX rig then; stellar gaming benchmarks but weak CPU performance. With some BIOS tweaking you can sort that out, but should you really have to when you've put down a grand for a PC? We're not entirely sure about that chassis either. From a distance it looks the business, but up close it feels like a budget option. It doesn't have a reset switch, either. Weird. But still, a great looking, strong gaming machine, with a good balance of components.